INDIO — Santa Ana’s speedy southpaw Luis Ramos (21-0, 9 KOs) remained undefeated, winning by unanimous decision over Hollywood’s “Sugar” Raymundo Beltran in a lightweight fight that looked much closer in the ring than on the judge’s score cards on Friday. Despite cuts on both sides of Ramos’ eyes, he out-battled the veteran Beltran (25-6, 17 KOs), who rallied after the fourth round behind some sizzling left hooks at Fantasy Springs Casino. The fight looked one-sided for the first three rounds, then Beltran began to time Ramos’ attacks with precision left hooks that snapped the sweat off of the Santa Ana southpaw’s head. Still, Ramos never wobbled. All three judges scored it for Ramos. James Jen Kin scored it 97-93, Daniel Sandoval had it 97-93 and Fritz Werner 96-94. A battle between undefeated lightweight prospects ended in a knockout victory for Texan Omar Figueroa (14-0-1, 11 KOs) after New Jersey’s Michael Perez (15-1-1, 9 KOs) couldn’t continue after the sixth round. Perez started out well behind a tight defense, but once Figueroa landed some body shots, the East Coast boxer began to slow down. Figueroa took over the fight and dominated with more punching to the head and body. Perez just couldn’t match the Texan’s punch output, and the fight was ended at the end of the sixth round. 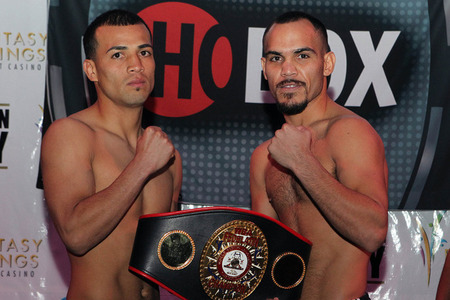 Figueroa was also disappointed that he couldn’t knock out Perez. “I gave my best shots and he didn’t go down,” Figueroa said of Perez. Chris Pearson (2-0) showed why he has been enthusiastically pursued by professional promoters and managers as he used his speed to fly past Long Beach tough guy Cleveland Ishe (3-5) in a four-round middleweight bout. The Ohio-based based boxer used his superior quickness, including a crunching right uppercut in the last round, to win by decision. All three cards had Pearson winning 39-37. Las Vegas’ Michael Finney (8-0, 7 KOs) pounded out a six-round unanimous decision in his middleweight clash against Minnesota’s Hector Orozco (4-10). The judges scored it 60-53, 59-54, 59-54 for Finney.